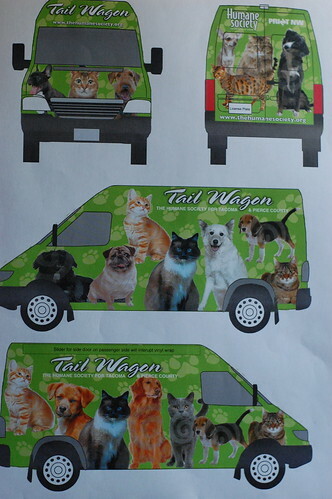 Just look at the plan for the new Humane Society vans. Recognize anyone? Yep. That's our Bean, larger than life! They're not done yet, but soon you'll see them tooling around the streets of Tacoma. There's a green one and a purple one too. I can hardly wait to spot one! Our Bean is going places! Literally !! Ms. Bean is an excellent spokescat for the Humane Society, so this honor is well-deserved. She's also flippin' gorgeous, so any van would want her image on its side. Congrats, Ms. Bean! A quarantine room named for you, and now your face on a van. Whoohoo! Congratulations & thank you for all you and your family do for the Humane Society!! Wow, the Bean is a feline supermodel indeed! And such a socially conscious one too. I will never be as full of awesome. Awww The Tailwagon - what a cute name! And what a celebricat you are Beanie girl! Remember us little people when you are a star! Bean, you're so awesome that they put you on both sides! I don't see any of the others duplicated like that. Congratulations!!! Okay, I was just blinded by your beauty. Now I see a few of the others are repeated as well, but you're still front and center! OMC - that is so AWESOME!!! Now she can be even more famous!!! That is cooler than cool! Grats, Bean! You deserve it! Oh wow - that is awesome! Congrats!! Yay for Charlene!!! I think I'll have to visit the Seattle Tacoma area just to catch a glimpse of this van! Oh Laurie!!! How wonderful!!! What a lovely, lovely thing! Congratulations! Such a beautiful spokescat for the Humane Society! And such a totally deserved honor, considering what you and your humans have done for the kitties of the Seattle/Tacoma area -- and, indeed, all over the country and probably the world! Rock on, Ms. Bean! oh, wow, congrats to charlene! and to the tacoma hs for both the new vans and the lovely array of beasties on them. and a purple one, too! i am all asquee! Holy moly. Now I'm gonna have to give my car a Bean makeover. You *rock* that van, Charlene! Congratulations Charlene! So happy to see you right in the middle too! And well-deserved, too! Bless her! What a beauty is our Charlene! That is awesome!!! Please post pics of the van when the wrap is done. It'd be great to see the end result! From cover girl (http://www.theittybittykittycommittee.com/2010/03/our-little-cover-girl.html) to larger than life pictorial. Congratulations Butterbean! Wow, Bean! You are a star! May I have your autograph...er...paw print? Cynthia, you mean like those signs "this van carries no cash"? Oh Bean, you deserve every accolade. I can't wait to see what you have in store for this year's fundraiser. How many squillion will you raise?? That is extra-awesome! You really are a superstar, Miss Charlene! And the little marmie kitten reminds me of Kirby Medley. Congratulations Miss Bean and Laurie! I can't imagine anyone better for this job! Congratulations, Charlene! They really picked the perfect kitty for the job! Woo-hooo! Wonderful representative for the HS's new Tail Wagon! Clever name, Beautiful kitty, fantastic van. makes me want to get on down to Tacoma to see them in person once they are on the road!